Someone gave a quite rubbish explanation about PA (People's Association) being the government arm, naturally it would need to appoint ruling party members as advisers and key board members. This is utter rubbish. The government of the day, will consist of at least THREE pillars of power, if not four or five. These basic fundamental arms include Executive, legislative and judiciary. It means that everyone in the legislative arm will also be considered as part of the government and yes, opposition party MPs included. The ruling party is just the custodian which provide the leadership to run the whole country. Thus there is absolutely nothing wrong to appoint the opposition MPs as advisers to PA grassroots units. It is perfectly legitimate to do so. In fact, it is totally illegitimate for PAP to appoint some NON MPs to be advisers of PA simply because they are not elected and thus NOT PART OF THE GOVERNMENT! I just simply cannot understand why someone who writes UTTER RUBBISH would have so many mindless people who like his post! Is the fluoride really affecting these people's intelligence or what? Nonsensical people should only belong to the rubbish bin. There is a Straits Times report today on a "spat" between Mrs Lee Suet Fern and the Ministry of Law. For those who are not in the know, Mrs. Lee Suet Fern is the wife of Mr. Lee Hsien Yang, the younger brother of Prime Minister Lee. The wife of Lee Hsien Yang (aka PM Lee's sister-in-law) has complained about the FT policy in Law practice, stating that a scheme Ministry of Law has put up for foreign law firms to register practice here has failed to create more jobs for Singapore lawyers. The Ministry of Law could have just rebutted her with their usual statistics and all but instead, the Ministry has gone further than that by putting up irrelevant information about how Mrs Lee has tried to get her law firm's foreign partner to be registered under the scheme after the deadline has closed. The statement of Ministry of Law insinuates that Mrs Lee was seeking preferential treatment by asking the Ministry to make exception of her law firm's application. By putting up such irrelevant information also insinuates that she is just talking bad about this scheme because she and her law firm didn't get what they want! I do not think it is right for the Ministry to put up such information amounting to personal attacks, not that I want to side anyone here, lest a member of the Lee clan. It is totally unprofessional for the civil service and Ministry to do that instead of putting up rebuttal solely as a matter of fact with regards to the issues at hand. The civil service should always maintain that code of neutrality and professionalism in dealing with issues and public debates or discourse on issues of public interests. The civil service and ministries should avoid getting entangled in personal attacks but just stick to the issues when putting up their stance. Let's make it clear once and for all. PAP government set up People's Association for its POLITICAL PURPOSES. If you go back to history, it was clear that PAP government, after marginalizing its leftist leaders like Lim Chin Siong (who were all detained under ISA), decided that they should strengthen their grassroot outreach (by the English Elites of the PAP) via their own grassroot platform. Thus, People's Association was formed to combat the leftist and/or "communist" grassroot system (they have their own "communication/community centres or points" within each district and village). This was the first major step of the English Elites of PAP led by the man who cannot be named, made with the aim of cutting down their reliance on their Chinese Elites/leftist faction within their party to mobilize the grassroot voters. "According to the Central Intelligence Agency of the US government, the People's Association had its origins as a national building programme 'designed to wean pro-Communist voters away from the opposition'. Besides serving as a communication channel between the government and ruling party at the top and the people below - making way for a more responsive government - it was also intended for the PA to blur the boundaries between the government and the party, such that 'the people tended to praise the party for activities undertaken by the government'." 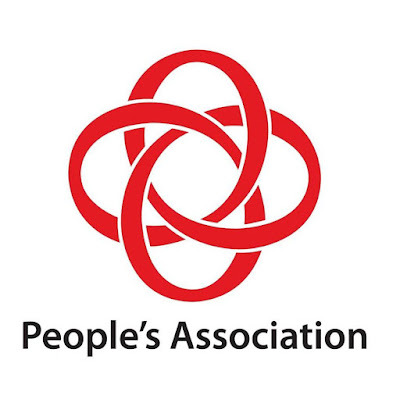 " The People’s Association (PA) is a statutory board under the Ministry of Culture, Community and Youth (MCCY) that was established on 1 July 1960 through the People’s Association Ordinance. Officially, the PA was formed to achieve two objectives: first, to develop patriotic youth leaders who would serve the community; and second, to create a common national identity through organising and promoting community involvement in social, cultural, educational and sporting activities. Politically, the PA was created to help the People’s Action Party government develop and maintain links with the people at the grassroots level through centralised control over the community centres. Initially, activities organised in such centres were meant to compete with those run by left-wing unions and associations for grassroots support." It was the most important political move the English Elites had made which anticipated or led to the eventual break-off of the leftist faction from PAP. There is no single doubt that PA was and still is PAP's major political tool utilized to prolong its hold on power. The plain fact is that its management board is filled with PAP ministers, PAP cadre members, current and former MPs, under the leadership of the Prime Minister himself. This is a gross abuse of power and National resources to serve PAP's own political agenda and needs. 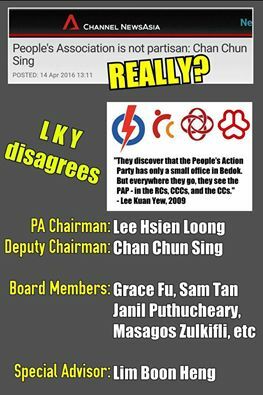 Nobody in Singapore would believe that all the grassroot organizations under PA are not related or work for PAP's political agenda. I have volunteered in my own CCC before when I was young and I was immediately passed a form to join PAP's youth wing when I progressed to lead a small interest group within the CCC. I didn't join, of course. And I have seen with my own eyes that CCC personnel have been mobilized to help out PAP's campaign during GE! Resources have been deployed for PAP's electioneering and I wonder why PAP still have the cheek to deny such "politicization" of PA which nobody in Singapore whom understand the workings would believe! Don't be shy, PAP. You have been abusing your power and the Nation's resources for your political benefits for more than 5 decades. Every true blue Singaporeans know that. It would be too thick skin and shameless to say otherwise. Why do I support Bernie Sanders? Where are the MPs during Budget Debate? Minister Gan Please Resign or Be Sacked!